Known as the Gateway to the North, Ueno Station is home to a number of shopping streets, museums, and Ueno Park which is a favourite place to see cherry blossoms in the spring. Ueno Station上野駅・うえのえき (上野: 上 – upper 野 – fields) was first built in 1883 making it one of the oldest train stations in Japan. It’s known as “the Gateway to the North” because it was the starting point for 蒸気機関車じょうききかんしゃ・steam trains chugging off to the snowier climes of northern Japan. Steam engines have given way to the 新幹線しんかんせん・Shinkansen, and with the extension of all Shinkansens lines from Ueno to Tokyo, Ueno’s importance as “the Gateway to the north” has been somewhat diminished but the station remains an important hub for commuters and visitors. 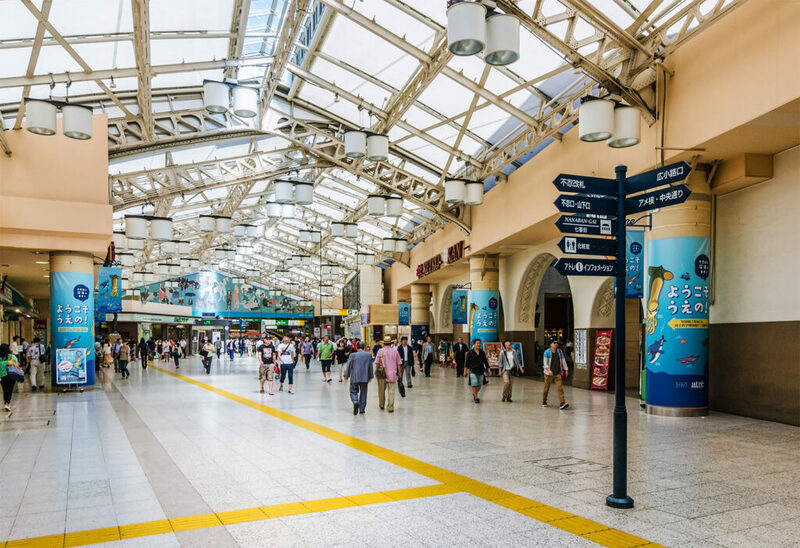 The present station building was renovated in 2002 to give it a new look and like all major train stations in Japan it contains, many stores and shopping arcades and レストランrestaurants. Ueno Station also has a branch of the Hard Rock Café. Ueno and the neighboring 浅草あさくさ・Asakusa area were collectively known as Shitamachi下町・Shitamachi , during the Edo江戸・えど, Meiji明治・めいじ and Taisho-eras大正時代・たいしょうじだい because they were, geographically the lowest area in Tokyo. During that period the area was home to Tokyo’s “lower classes,” such as 漁師りょうし・fisherman, craftsmen, sailors and merchants. The area produced a great deal of what was unique in the Edo and post-Edo culture and was the main entertainment and market area of Tokyo. The market still exists today. To the 東ひがし・east of Ueno Station there are many street markets, hundreds of clothing stores selling new and used goods, and many other stores, large and small, selling everything from 食べ物たべもの・food, アートart, 衣類いるい・clothing and 電化製品でんかせいひん・electronics. The west side of Ueno Station is home to 上野公園うえのこうえん・Ueno Park, the largest and oldest park in Tokyo. Until the Boshin War of 1868, when the samurai families of northern Japan attempted to overthrow the Meiji Government明治政府・めいじせいふ, the grounds of Ueno Park were the home of Kaneiji Temple寛永寺・かんえいじ, a site built to protect Edo City. In an attack and subsequent retreat by northern samurai forces, all of the buildings of Kaneiji Temple (save for the 5-story pagoda that now sits at the north end of the park) were burned to the ground. Five years later, in 1873, the Imperial Family opened the land to the people of Tokyo to be used as a park. Fifty-one years later in 1924 the Taisho Emperor gave the park over to the City of Tokyo. Ueno Park is home to the Tokyo Bunka Kaikan東京文化会館・とうきょうぶんかかいかん, Tokyo’s most well known venue for opera, classical music and dance performances; the Ueno Zoo上野公園・うえのこうえん, Japan’s oldest and most famous Zoo; Toshogu Shrine東照宮・とうしょうぐ a gorgeous and vibrantly colored shrine dedicated to 徳川家康とくがわいえやす・Tokugawa Ieyasu (the carved stone and cast copper lanterns, two exquisitely carved dragons, the arch lined pathways and intricately decorated buildings make it very worth visiting); and the Jomyoin Templeじょうみょういん・Jomyoin Temple (famous for its 84,000 Jizo statues). Lastly, most of Ueno’s 8,650 trees are sakura trees, making it Tokyo’s favorite place to see the sakura blossoms in the spring. With so much to do in Ueno, the hardest thing of all is figuring out where to start.